It?s time to give your skin a healthy beauty breakfast! Treat your skin with this powerful multi-tasker that corrects, hydrates, repairs and protects your skin from sun damage, leaving it feeling healthy and fresh. Nykaa SKINgenius BB cream gives you the benefit of skincare in makeup. Enriched with extracts of Aloe Vera, Green Tea, Cucumber and Jojoba, this cream gives a boost of anti-oxidants to your skin, making it naturally healthy and radiant. Explore the entire range of BB & CC Cream available on Nykaa. 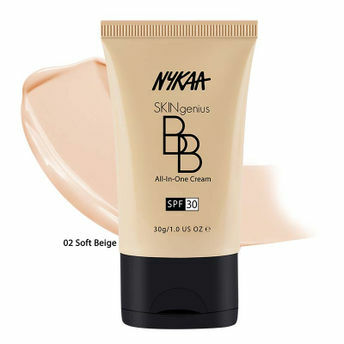 Shop more Nykaa Cosmetics products here.You can browse through the complete world of Nykaa Cosmetics BB & CC Cream .Alternatively, you can also find many more products from the Nykaa SKINgenius BB Cream SPF30 range.